ECommerce Menu Design with JSON Data. Now the right time to build an online selling portal, people started believing online shopping for buying things. This tutorial helps you to to speed up the most important product category navigation menu system for your ecommerce projects. 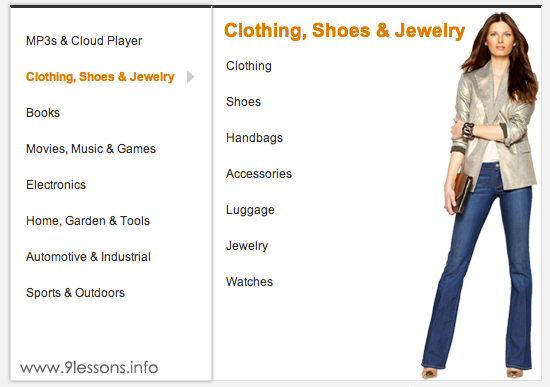 I had implemented Amazon style menu with category image using PHP, MYSQL andj JQuery. Sample database categories table contains four columns cat_id, name, paren and media. 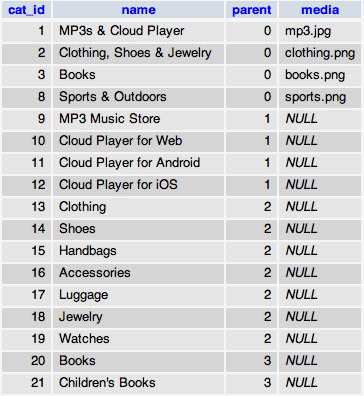 Category and Subcategory data stores like this format. 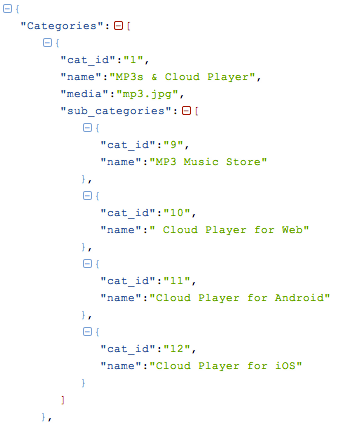 Contains PHP code generating JSON data out from categories table. Database configuration file, modify username, password and database values. how to include breadcrumbs for this jsonmenu..
check this link to create thumbnails. good example for ecommerce..can you tell me is it applicable to OsCommerce. You have to use ffmpeg to achieve this. @chetan you can do it by using ffmpeg tool. You can get complete info about the video and you can limit the video duration in the output and also you can embeed a watermark of ur website using that tool. Awesome,can we add loading part so we dont see the image as it loads? How return string with breakline in JSON??? Wow, very good tutorial, I like! Nice tutorial, but why do you use an ajax call to fill your menu ? Is'nt it better to fill menu with PHP than JS? I think this is very bad for accessibility. This is also very bad for SEO. Cool post. Would you mind elaborating a little on each step? Excellent post, thanks for all your efforts. postingan yang bagus tentang"ECommerce Menu Design with JSON Data"
Nicely rendered menu srinivas, looking for more posts like this. Keep up good work. PLEASE , watermark! please please please! Thanks for that article, please look forward to publish more of such useful posts. Verry good ! thank so much ! Can you please tell me how to add link? Please can you tell me how to add link. Is it possible to add this on Cs-Cart 3? Hi Shrinivas, thanks a lot for this tutorial bcoz i've been searching for something like this from a very long time!!!! I also have one question, can this menu be created using ASP.NET instead of PHP and how should i go forward with it???? Very Nice and Good example.I want solutions to display data from json files with out using db . What are the methods we are having to display on HTML page . how to display subcategory inside subcategory that subcategory..